A few years back, Irwin released a series of Vise Grip locking pliers without a release lever. (You simply pulled on the handle to release them.) 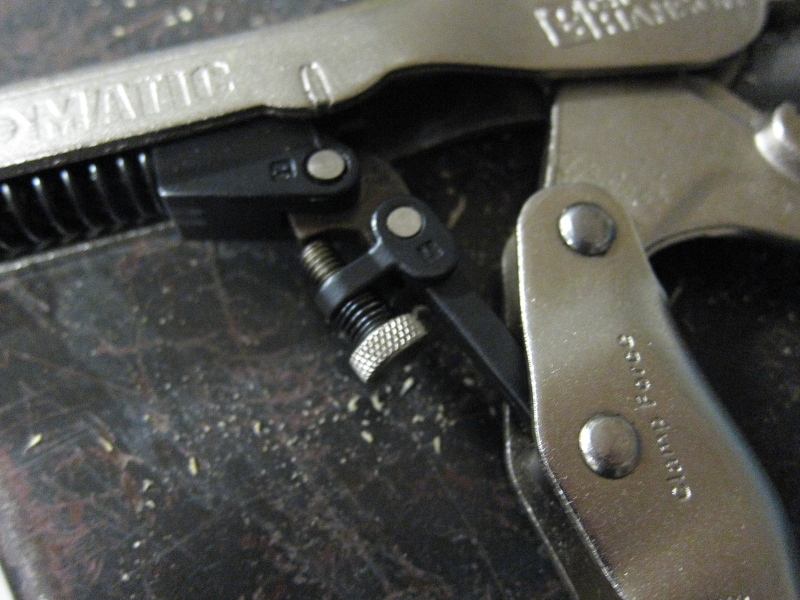 Now CH Hanson’s come out with another innovation in the field: self-adjusting pliers. Just squeeze to clamp ’em down an whatever you’ve got at hand. 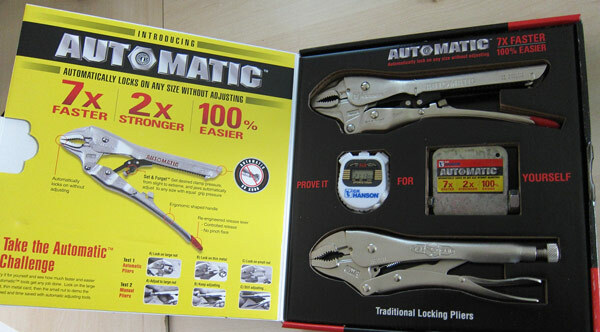 We received the pliers in a press kit, complete with a set of brand name Irwin Vise-Grips and a little piece of steel with two different-sized nuts welded to it and a stopwatch. CH Hanson’s challenge: Lock each of the pliers onto both bolts plus the thin metal to which they’re attached and time the process. So we did. It took us 38.15 seconds to grab all the obstacles with the Vise-Grips and just 19.31 seconds with the CH Hanson automatics. One point for Hanson. But what about real use? We dumped the automatics in the shop work tray for a few weeks and ended up grabbing them to replace a Moen shower faucet cartridge — kind of a tricky test, actually. To remove the cartridge, you have to grab a relatively brittle plastic piece, digging into it a bit to get enough purchase to turn it (against possibly years of calcium buildup). 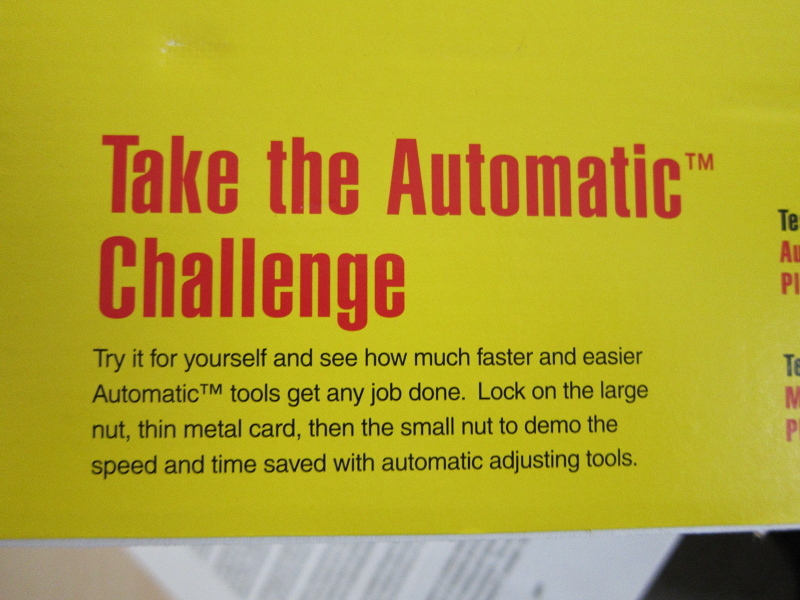 Clamp down too hard, though, and you’re back in the shop looking for a drill and easy-outs. With standard locking pliers, getting this perfect grip involves adjusting the pliers slightly smaller than the target to add grip force, or slightly larger to grip less. The Hanson pliers offer similar functionality through a small screw in the center of the pliers. 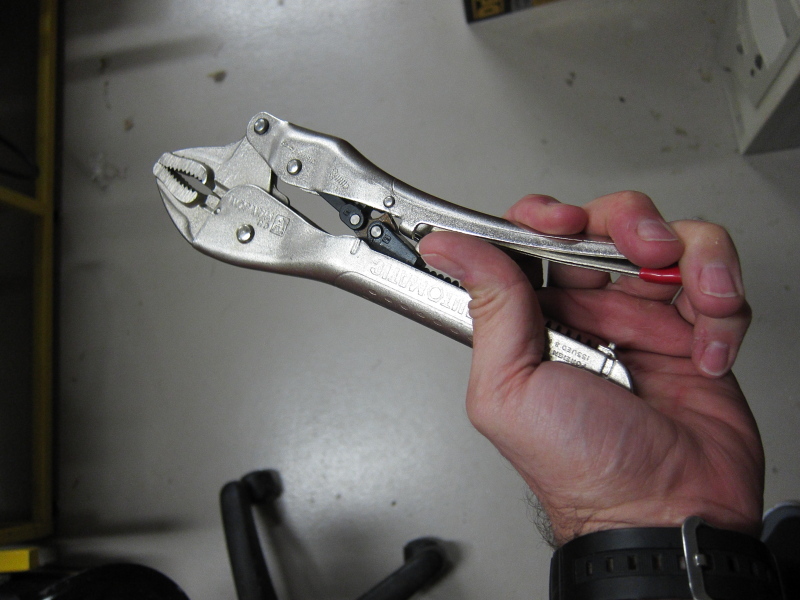 Tightening the screw makes the pliers grip harder, and loosening it weakens the grip. It’s a little more cumbersome than twisting the big knob on the Vise-Grips, but once you’ve dialed in a grip setting, it stays set until you change it again — even if you grab differently-sized items. Another point for Hanson. The Hanson’s release lever also operates backwards from what you’d expect: You push the Vise-Grip’s lever to the outside of the pliers to release, where the Hansons release with a squeeze toward the pliers. We can see the benefit. We’ve sent Vise-Grips sailing across the shop more than once by popping them loose under a lot of tension. 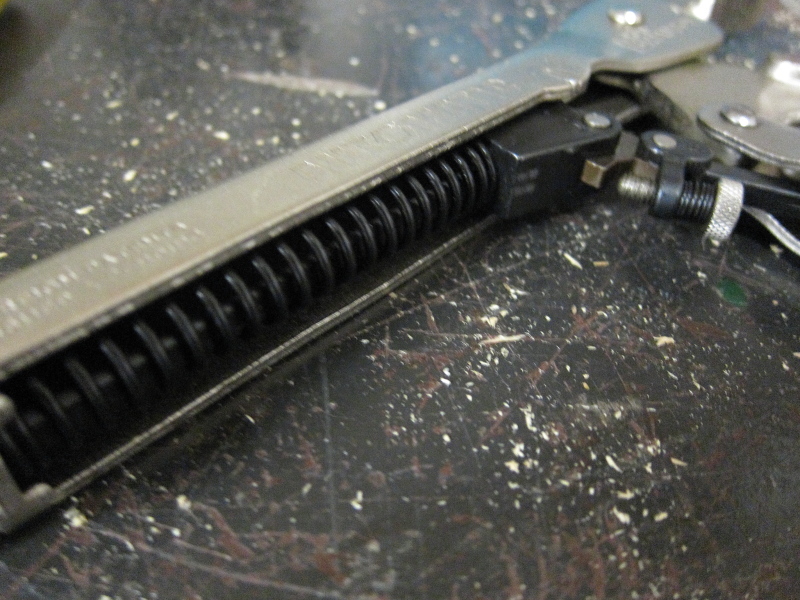 The Hanson’s squeeze-style release promotes a better grip on the pliers. Just be prepared to start at it a second or two before you remember how they work. Honestly, we kinda laughed it up a bit when these arrived. Why mess with something that’s worked for years? But they’re actually pretty slick. And they feel every bit as sturdily-built as the Vise-Grips, unlike those cheap-o knockoffs you find in discount stores. Individual pricing runs around $9-10, and CH Hanson offers a huge selection of options ranging from needle-nose to C-clamp, and you’ll find plenty of two and three-pair kits online and in stores. If you use your locking pliers a lot, they’re worth a look. Wouldn’t it have been better to compare them to Irwin/Vice-Grips newer fast release pliers? Um, you do know Vise-Grips have not been made in the USA for over 2 years? He wasn’t calling Vise-Grips cheapo…he was calling them sturdy. 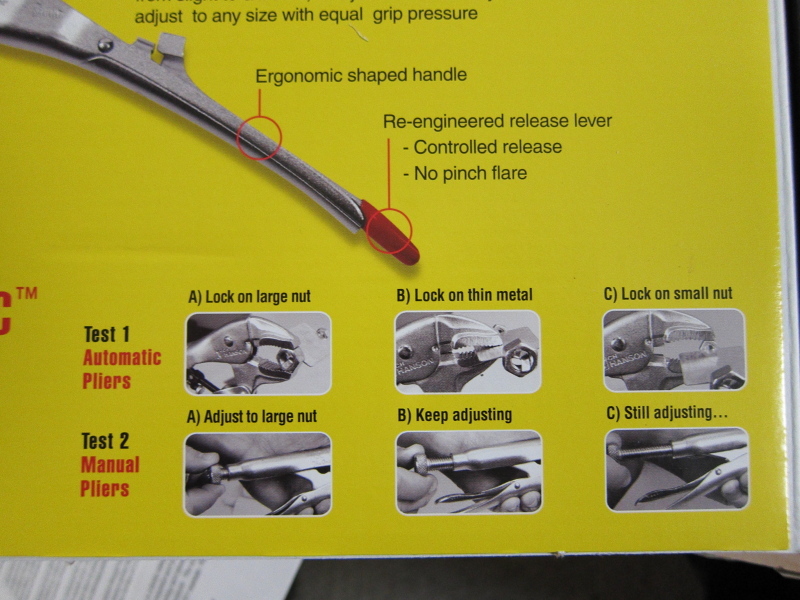 The cheap-o knockoffs he was referring to were imitation vise-grips that you would find in discount stores. These are pretty handy, BUT I find it impossible to close them around larger objects one-handed. I like ’em a lot, actually, but trading two-handed adjustment and one-handed closing for no-fuss adjustment and two-handed closing means I’ll have to keep both in my toolbox. I believe their parent company (Newell Rubbermaid Inc.) has licensed them. I’ve seen Vice-Grip clones labeled Knipex that say they are made in Germany. Whenever I pick up a pair of these new super pliers; I ask myself just how tight (I mean really tight) can I get these without any slippage. Will they actually save the day? Will they reach that impossible spot? Will I look forward to using them in the future? My American Made Vise-Grips have never failed that test; I can always count on them. Mr. Man’s comment, ditto for me. I’m guessing these are still made in China though. The whole lever-free thing was just a Gimmick so Craftsman and others could have a locking plier design that didn’t infringe on the Vise-Grip patent. So of course Vise-Grip made theirs in a lever-free version as well. In general light duty use, either works fine. But the lever on the Vise-Grips comes in handy when you want a smoother release, especially under big time tension. I’ve taken to only buying old USA-made Vise-Grips when I find them, since I can’t stand the China-made Newell-Rubbermaid stuff (well, except when I get them for free to use as welding clamps). Anything that’s an improvement in the locking plier design is welcome as an alternative to buying the made in China Irwin/Craftsman/etc. stuff, but if CH Hansons are also just low quality China-made junk, there’s not much point other than the size/release gimmick. On pictures 5 and 6, does it say “China” in small roll-marked letters on the handle? Yes it does read “China”. I’ve said it before, and I’ll say it again. 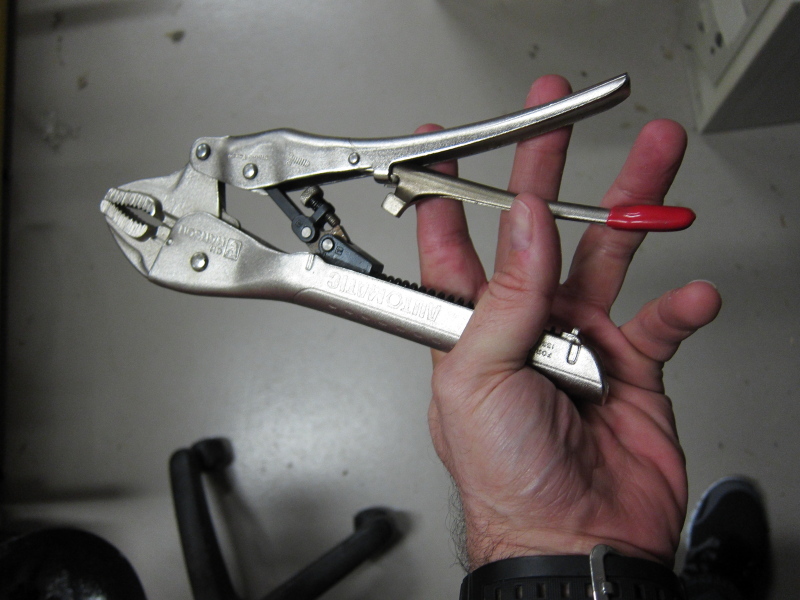 I own several pairs of these pliers, and they are NOT ( I repeat NOT ) your typical Harbor Freight Chinese crap! These are tools that look and feel like everything you can expect from an American-made tool. It might say “China” on the handle, but it says “Cha-CHING!” every time I use it. These locking pliers are amazing, well-built, well-finished, etc. I couldn’t ask for more. These were “Lockjaw” locking pliers before they were sold to Hanson, who apparently tweaked the design a bit. I have the originals – they’re very well-built and very well finished; superior to anything Irwin has made recently. if you are old enough to recall, vise-grip added the release lever because we were getting too dainty to just pull on the handle. i think that irwin’s move offshore is one of the saddest tool events of my tool buying life. 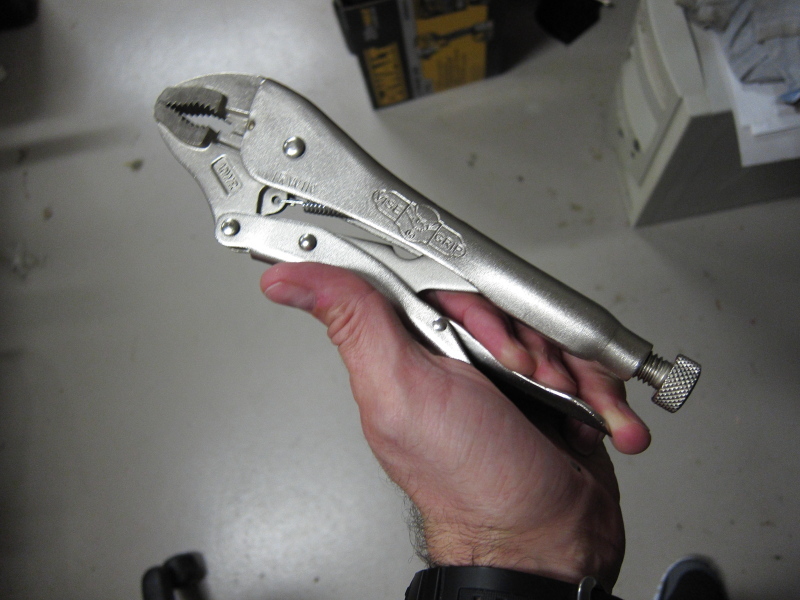 i’ve carried those pliers since i was seven years old (a pair were clamped to my bicycle seat post for emergencies). since their move, i buy chinese crap from the chinese and skip the middleman. that said, i was given a pair of the auto pliers and they work just fine. I wondered what you lot were on about with the release lever, then I took a closer look at the photos. All the locking pliers I’ve ever used have had the same style release lever as the Hansons, squeezing on the small lever to release without having to change your grip on the pliers. I wonder if it’s a British thing. I’m not saying they are crap just because they are made in China, there’s plenty of China-made stuff, tools included, that are top of the line. But the China-made Vise Grips are poor metal and build quality compared to the originals. The Lockjaw thing makes sense if that’s all these are, just with a new label and some tweaks. Maybe this alternative design originated in Europe so these might be more prevalent across the pond. After thinking about it though, I don’t really see the appeal of the speed aspect. Do you really use locking pliers to grab things for just a second then rush to use them on something of a different size for another second afterwards? Marketing that as a benefit seems like they’re trying to be clever but avoid real issues like durability. Do these even have a lifetime warranty? Still, if they really do lock on stronger, and it’s easier to lock ’em up and take ’em off, great. I haven’t seen these ANYWHERE though, or Lockjaw/CH Hanson clamps at all. If these are that good and at the same or similar price point, they should take a lot of sales away from the rest, especially IRWIN. 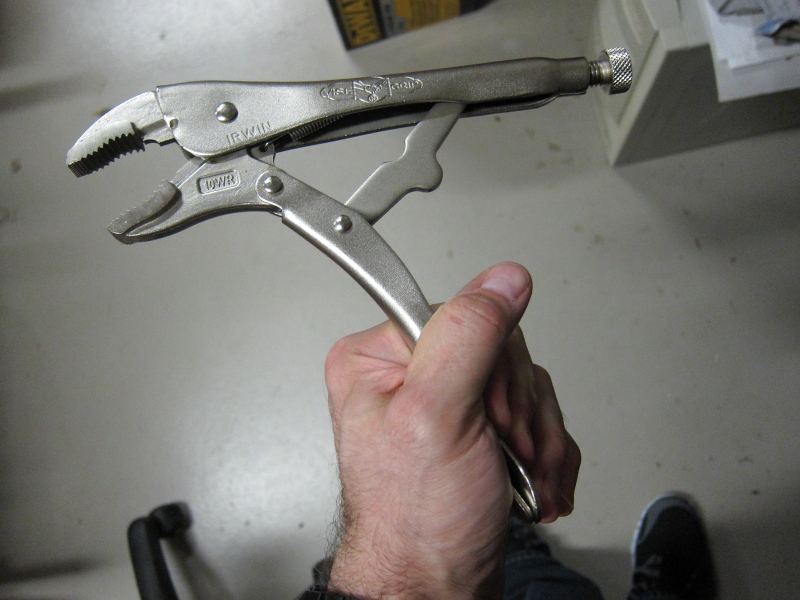 I had a pair of locking pliers with a reversed release lever (like the Hanson) a long time ago, probably Sears. Anyway, I was clamping down really hard on something or another and when they snapped shut the lever pinched one of my fingers and 1/10 of a second was all it took to get one monster blood blister. I threw those out and have been using Vise Grips and nothing else for 20 or more years. Most stuff aimed at the DIY homeowner is made in Asia. A lot of “professional” stuff comes from outside the USA too, even a name like Snap-On doesn’t give you absolute no failure. And depending on the rep that drives the truck, the service can be disappointing. I purchased some self adjusting pliers, figured they would be great for doing alignments (adjusting tie rods). After a few tries with them, I tossed back into the tool box where they have migrated to the back of the drawer due to lack of use. Ditto what pencilneck said. We have a pair of these in the shop, and they sit in the back of the pliers drawer in the number 3 toolbox. By the time we have the locking pliers out, more slippage on the fastener is not what we’re looking for. Locking pliers are rarely the right tool for the job, but they’ll get you out of a jam. I have plenty of time to adjust my vise-grips nice and tight-like before I go to the torch. I have the “Lock Jaw” variety in *two* sizes (important to note, IMO) and over the last two years they have become the ones I reach for first. They are easy to grab with gloves on and attach to a many sizes of nuts without having to fiddle with making adjustments at all. By design they have an odd failing, in that as the work pieces get larger, the applied torque gets smaller. They are also fiddly to adjust. With that in mind, I have a small pair set for anything 3/8″ or smaller and a big pair set for 1/2″ and over. I’ haven’t had to re-adjust one since buying them. If precise torque is what I’m after, then the old ViseGrips are the right tool, and not far away. My compliments to the commenters, as this discussion allowed that there may be appropriate uses for many of the different styles of locking pliers. I found the “take no prisoner” advocacy of Vise-Grips or Lock Jaws or etc. in earlier discussions very tiresome. As I said then, I think of locking pliers as clamps, and everyone knows that there are never too many clamps in a shop. Also, thanks for spelling Vise-Grips correctly. We bought one set to try them out. Everyone LOVED them. We loved them so much, we bought 6 more and literally gave away our “normal” ones for free (sorry, they’re gone). For us, it’s a no-brainer to use these. We’ll never go back. Money well spent. I have a set of the lock-jaw version. I ran across them a few years ago in a welding class, I assume the ones being used were quite a few years old at the time and were in good working order. So I ordered myself some, The Lock-jaw brand ones are very nice quality, some of the other branded ones leave a little to be desired if you need to make a really tight clamp. I bought some of these after saw Charlse neil using them. I’m a woodworker and for clamping wood together without maring it these things are perfect. Quick engage and release which i need i’m a one man shop and my oldest left for the army a few years back so no extra hands. Charles had a bulk buy and I bought one and some two of every size they are fantastic. Unfortunately there are no locking pliers or “Vice Grip” style pliers made in the USA any longer. I would recommend staying away from the Chinese made tools as they still lack the quality and heft of the USA tools. The other option is a company called Grip-On out of Spain. At least they are not a communist country and their tools are quite nice. Go to http://www.grip-on.com to check it out. The only distributor I know of is Anglo American Tools. Do a Google search for their site. Let me know what you think. I’ve used these self-locking pliers for about 4 years now and I have found their use very situation dependent. The grip is not stable. It is strong, but you can torque things out of its spring loaded grip. Vice grips lock and crush hard on things which makes them indispensable. I mounted this self adjusting vice grip to a table and they make an awesome quick vice grip holder for light-duty gripping of just about anything, but I stress light-duty. If I had to choose between only these and only vice grips, vice grips win out by a large margin due to their chunky dependability and classification in the “tough big-scale job” work category. That being said, I purchased a line of supposedly Vice-grip brand 11 piece vice grip set for $100 and it was china made junk. So be sure to buy from quality dealers. That being said, I purchased a line of supposedly Vice-grip brand 11 piece vice grip set for $100 and it was china made junk. So be sure to buy from quality dealers. I have a pair of Draper self locking grips, but they’re not locking any more. There is no visible sign of damage and no loose joints. Any ideas anyone? What hinterland country are these made in? I have the same problem as Bob, I have a pair of CH Hanson automatic, but they’re not locking any more. “Benchmark” model 6CJ and I would buy some more if I could find them Benchmark you would think Sears but no.